Teenage Mutant Ninja Turtle, we finally meet! What shall you be named? 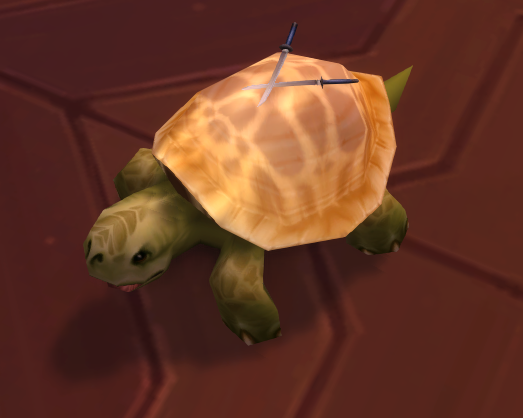 Although it doesn't show in the pet manual, these turtles have little bandannas over (well, above) their eyes and crossed swords on their back when they are summoned! Sadly, they don't go "COWABUNGA!" or "PIZZA TIME!" when they're clicked on. They sound like any ordinary turtle in that way. Are the four turtles summoned of the same or differing qualities (poor, uncommon, rare)? Trying to determine if I should buy one for each of my friends or just invite them when I use mine. If they are all the same quality, I could save a heck of a lot of eyes by just letting 3 friends catch one when I use the item. Thanks in advance! Unlike the pet battles with the Blinde Ratte in the sewers, the Young Mutant Warturtle battles give no bonus Sightless Eyes. In addition, they are unkillable, so you don't have to worry about trolls AOE'ing your turtles. .... just the people coming to battle them. As far as I have been able to find, each of the turtles spawns its own rarity. That is to say, you won't automatically get rares every time (or uncommons, or poors, or whatever). If the guards are gone, people can and will AoE to drop you out of the pet battle, has been my experience. Buy a bodyguard before you summon. Be careful; it's a PVP zone, so if somebody hits you while battling, you'll be thrown out of the match and most likely lose your turtle(lost 1500 eyes this way). So be sure you have a fresh bodyguard and no rare-fights around when doing this. Don't mind the rarity, with just 15 Pet Charms you can buy a rarity stone from your garrison(or probably sonewhere in dalaran too now-a-days). Got mine just now because someone else had put down the turtle item but everyone was too busy fighting a rare to notice and grab the tames. Didn't have to spend my Eyes, which was nice. One thing I noticed, and I don't know if it's intended or not, but there was not the typical interact icon normally associated with mousing over a tameable pet. All I got was the normal cursor, but clicking on the turtle started the pet battle anyway. So, if you see the paws there, go ahead and click. You might get lucky! I just saw one spawn with Saphirglühwürmchen as a backline pet, in case you missed that. It also would have been really cool if instead of always being swords it had a 1 in 4 chance of being a bo staff, nunchucks, a pair of sai, or the swords. It's still a really cool pet though. The turtle is sized differently than the swords / headband on them. So you can't see the headband and the swords look odd. If you use a mini-pet treat, it shrinks the turtle to be the proper size. This guy is now an entirely different kind of mutant turtle. He now has telekinesis and is levitating the swords above his shell. Dieser NPC befindet sich in Dalaran (21).